NOTICE: Requires the base game Warlock 2 in order to play. Activation key must be used on a valid Steam account, requires internet connection. 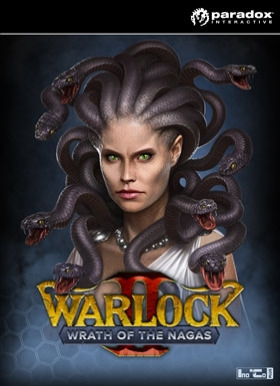 ABOUT THE GAME	Wrath of the Nagas is the first expansion for Warlock 2 and with it developer InoCo introduces the greatest threat Ardania has ever seen. Lurking on the fringes of our world for centuries. Waiting for an opportunity to strike, invade a… nd conquer. The Nagas have returned! Aided by ancient beings not seen in Ardania since the age of the Great Kings such as gorgons and harpies, they seek to blacken the skies, poison our lands and wipe out all trace of human existence! Will you fight the tidal wave of death and destruction or will you be consumed by it? KEY FEATURES The “A clear threat” campaign: Battle Naga threat on the shards of the broken worlds. Find and destroy them before their waters engulf everything The Naga race: A new unique race that builds the majority of their buildings on water and have amphibious units. New Great mages: The mighty gorgon Sfeno & the Naga general Rhin-gaa-rook are playable as leaders for the Naga race. Two new lords: The swift Ace Harpy and the powerful Secret Physician can be chosen as starting perks or encountered in game. SYSTEM REQUIREMENTS Minimum OS: Windows Vista 64-bit, Windows 7 64-bit Processor: Dual Core CPU with 2,66GHz clock speed or higher Memory: 4 GB RAM Graphics: nVidia GeForce 8600 GT or ATI Radeon HD 6570 DirectX: Version 9.0c Hard Drive: 2 GB available space Sound Card: DirectX 9.0c compatible	Recommended OS: Windows Vista 64-bit, Windows 7 64-bit or Windows 8 64-bit Processor: Intel I3-3240 @ 3.4 GHz or AMD Phenom II X4 955 @ 3.2 GHz Memory: 4 GB RAM Graphics: nVidia GeForce 550 Ti or ATI Radeon HD 6850 Hard Drive: 2 GB available space Sound Card: DirectX 9.0c compatible	© 2014 Paradox Interactive™. Trademarks belong to their respective owners. All rights reserved.